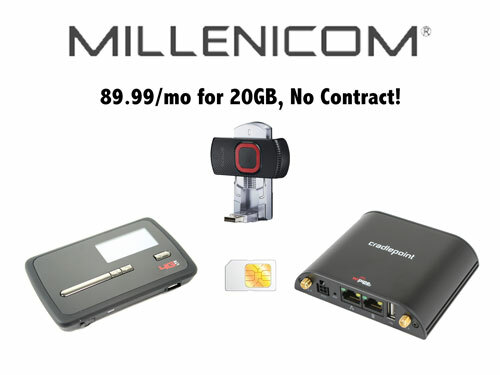 Congrats to Theresa A. of BRADFORD, Arkansas who just won a $25.00 Restaurant.com gift code for writing a review for Millenicom $89.99/mo 20GB 3G/4G Service (Requires Compatible Device) at 3Gstore.com! Every week we randomly pick one product review from the previous week and award the writer a $25.00 gift code. We appreciate ALL the reviews our customers write, whether they are positive or negative - honest reviews like Theresa A.\'s help other customers decide if the product is right for them. After you purchase a product from 3Gstore.com, we encourage you to log in and 3Gstore.com and leave a review letting people know how the product worked for you - you'll be helping others, and you'll automatically be entered to win a restaurant.com gift code!. Great services i get double the data that i had from verizon for only $10 extra. I'm using this for gaming which is working great with the UML-290 and peplink soho. Bought a static ip also but unfortunately they get them randomly generated by the upstream carrier which is verizon so my ip's location was about 600 miles away from my physical location. Which is why i gave it 4stars instead of 5stars, It caused about 60ms of extra latency which was frustrating because i finally had a open nat for gaming but was lagging very badly. So instead i contacted them for the standard dynamic ip now have a moderate nat with pings around 60ms-80ms which is working great! I wouldn't recommend the static ip for gaming but if your using it for cameras it works exceptional. Finally enjoying internet again without a strict nat and plenty of data for gaming i'd recommend getting Exede Viasat too for downloading large files/updates or games during their late night free zone. If you live out in the middle of nowhere like me this is as good as it gets for gaming. Option Cloudgate 4G Ships September 10th!